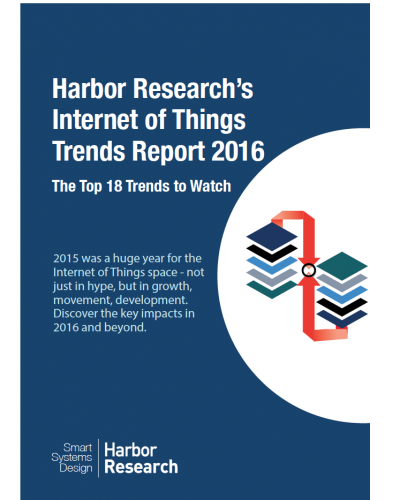 This report is Harbor Research’s perspective of the most important trends driving pervasive computing, the application of sensors, and networked services— what many call ‘The Internet of Things’— in 2016. To ring in the new year, Harbor’s analysts have compiled the most important movements and themes we found in 2015 and explore their significance in 2016. Unlike other predictions pieces, our objective was to illustrate the evolutionary trajectory of this phenomenon by showing where movement is already well underway and how that movement will impact and push forth wide swaths of the market in the immediate years to come. Harbor’s analysis of key movements in 2015 and the implications for 2016. Examples, facts, and figures for each of the 18 trends. Key questions your business should be considering this year. As always, we welcome your feedback, insights, and questions on any of our content, research, or analysis. Thank you for your interest and for reading.